As anti-Trump protests erupted in the US and around world, Donald Trump was sworn in as America's 45th President. Donald Trump blasted Obama's government in his inaugural speech and promised to give the power back to the people. 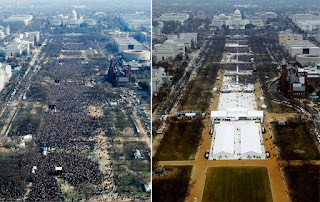 Inpsite of his fiery words, and obviously teeming supporters, check out the number of people at Obama and Trump inauguration ceremonies—the difference is quite shocking. Fact is the inauguration of Barack Obama in 2009 was quite a bit more packed than Donald Trump’s—by a margin so huge it's almost embarrassing. In these side-by-side photos above , the Mall in Washington DC barely looks the same. Obama’s inauguration, seen on the left, had spectators filling pretty much the entire span of the Mall and even overflowing. It was clearly a nostalgic moment in American history. Trump’s was a little more sparse. A lot more actually! And just for full disclosure, both photos were taken at approximately 12 noon – right as the inauguration was getting underway. But the disparity does make sense. Although history was being made in both photos, Obama was a much more unifying figure, and his inauguration – as the country’s first ever African-American president – was far more historic. Trump, however, is much more polarising – and at around 48%, his approval ratings are the lowest ever of any incoming US president. He has talked the talk. And now America and the world watches to see if he walks the walk.